Cold calling is the marketing term used to describe the process of approaching prospective customers or clients (usually by telephone, email or via a social network such as Facebook or linkedin) who weren’t expecting your call. 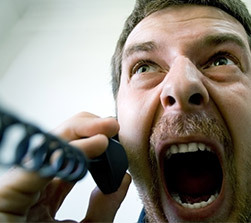 The word "cold" is used because the person receiving the call was not expecting a call or did not specifically ask to be contacted by a sales person. A cold call is usually the first part of the sales process generally known as telemarketing. The Privacy and Electronic Communications (EC Directive) Regulations 2003 makes it unlawful to contact individuals for direct marketing purposes without their prior consent. Register your number with the Telephone Preference Service. Don’t provide your details on comparison websites. They are notorious for selling information in an almost unprecedented fashion. See an interesting article on the This Is Money website. It’s a proven fact that many spammers search social networking websites for data to build up their spam lists. Emails, phone numbers, names and addresses are all used by spammers. We've created fake social network website accounts to see just how bad it can be and it was unbelievable the amount of spam we received by email, text and cold calls.